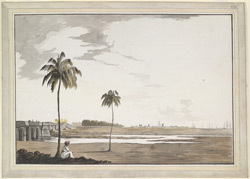 Water-colour by Elisha Trapaud dated c.1785, depicting Fort St. George at Madras in the distance. Inscribed on front in pencil: 'Fort St George from the Westward. Capt. Trapaud. 1786. '; in ink:' E. Trapaud 1785'. Madras was founded in 1639 by the British East India Company and was the first important English settlement in India. The fort was constructed on the seafront in 1644 as a trading post and base for European residents, and became the Company’s headquarters on the Coromandel Coast in 1641. It initially consisted of a rectangular enclosure with four bastions but was gradually expanded and strengthened during the 17th and 18th centuries to protect it from the armies of the French, Dutch, the Mughal emperor Aurangzeb, and the Marathas. In 1711 the inner fort walls and corner bastions were pulled down and Fort Square was demolished. Between 1746 and 1748 the fort was occupied by the French under Labourdonnais but was restored to the British under the Treaty of Aix-la-Chapelle of 1748. Designs for its remodelling were prepared in 1750 by Bartholomew Robins, a mathematician, and the work was not completed until 1783. Many historic buildings have been erected within its walls, including the Accountant-General’s Office, used as Government House until 1799, the Secretariat, and St Mary’s Church, the oldest surviving Anglican church in the East. The bridge seen in the foreground in this drawing led from the Governor's country house across the Coum River.